The Technical Version of what constitutes SEO can be found by visiting this page on Wikipedia. 1. Optimal Build Quality – Build your website in a way that visitors get the best possible experience. This can include the right sort of software, the way it is written, the way the images are structured, how fast it loads, how it responds on mobile devices and dozens of other small boxes ticking criteria that I won’t go into right now. Google measures your site on how user friendly it is and rewards those that take the time and effort to make it so. 2. Regular Fresh Content – Keep your website fresh with new relevant and unique content. This is not just a few words, really roll your sleeves up and get under the skin of your speciality, write thought pieces, use images and video. Share them in Linkedin and Twitter. The more you update your site the more people will visit to see what you’ve been up to. Google will crawl your site every now and then to see what you’ve been up to. The more you update the more you get crawled. 3. Become an expert – Google is trying to find the best in their field If you’re the best dentist in Essex or the top cosmetic surgeon in Leeds it wants the world to know about it. So start getting known. As a Healthcare SEO agency we would suggest you get yourself mentioned in the press, write articles in the any associations of governing bodies you belong to, make the world know you are an expert. The more respected the sites you are mentioned on (and linked from) the more kudos Google will give your own site which will rocket your website up the rankings. The good news is that most website owners don’t do SEO in the right way and largly ignore the above so if you implement a good strategy you will rank for your chosen keywords. The bad news is that it’s continual sustained business effort that cannot be done with short cuts. You have to do optimisation in a good and honest way, in the way you run your clinic or practice in the real world. It’s even possible that you have been penalised in the past for bad Healthcare SEO practices which may well have to be cleaned up before you embark on any of the above. One way of testing to see if your SEO company is worth it’s salt is how it’s ranked for it’s own keyword. 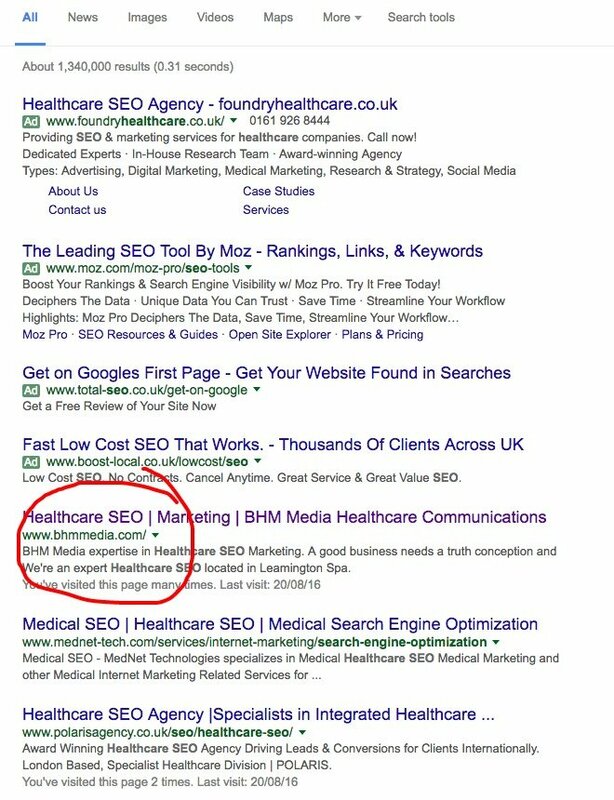 Our main business is Healthcare SEO – if you Google it now you’re see we are position one throughout the UK. Or scroll down to see the latest screen grab – we know what we’re talking about! We’ve worked with hundreds of companies to get their websites ranking on the top of Google. If you want to discuss your search engine needs then contact us today for a free 15 page report.